Over the past several weeks, the “Poker” metaphor has come up repeatedly in discussions with my teams… not at all surprising when working with innovative minds and risk taking spirits. The game of poker is a now infrequent passion of mine, and I have been playing in some capacity since I was in high school. I actually still try to maintain an annual game with some of these same friends over 20 years (is that possible?!?!) later. I also have played in some low-stakes card games at local casinos and in Vegas, but these have been more like the “Spring Training” of Poker rather than the “World Series”. Over the years, I have definitely won more than I have lost, and used to joke with my wife that this hobby would one day pay for our kids’ college educations (I’m nothing if not an optimist). Now… while I may never be in a position to quit my job and become a professional card shark, I do believe that there are several lessons learned at the poker table that can be reapplied in the office. Every day, in the high stakes game of Innovation, we make choices about which “hands” to play, about how much to invest in a given hand, and about which hands that we should sit out. 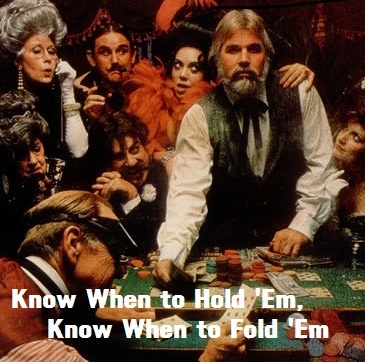 To quote Kenny Rogers from “The Gambler”… You’ve got to know when to hold ’em, Know when to fold ’em, Know when to walk away, Know when to run… and getting this balance right is key to maximizing the odds of success. 1) The goal is not to win the most pots, but to win the right ones. Particularly if you pride yourself on being a risk-taker, if you always see the glass as “half full”, and if you see the potential in every situation… no matter how bleak, it is critical that you maintain the discipline to not play every hand. 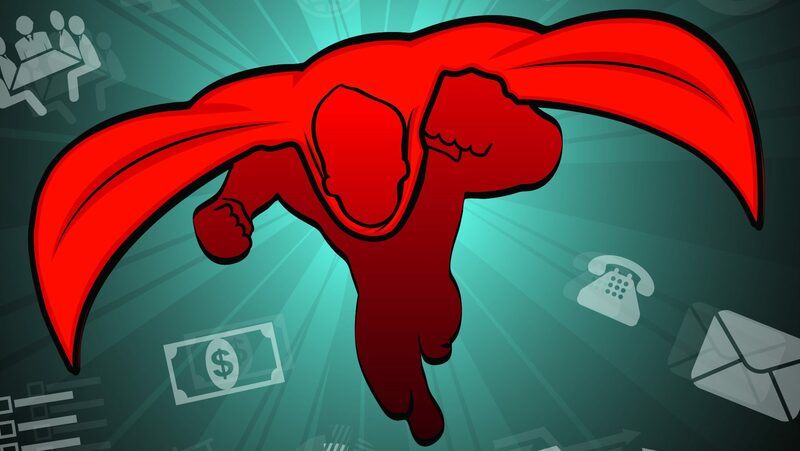 Statistically speaking, the more hands that you play, the more you will win… and also the more you will lose. There is no prize for winning the most hands in and of themselves, but rather for ending up with the most money at the end. If you dilute your bets by playing every hand, you likely will not have the time, capacity, or resources to invest big on the big pots. It is important to take risks, but the right risks- bet big on the pots where the odds are in your favor and the stakes are high. Choosing which hands not to play is at least as important as choosing which ones to play. 2) With the right pot and the right cards, be willing to go “All In”. While it is important to be choiceful, don’t be conservative. When you get dealt the right hand and the stakes are high, be ready to throw everything you have against it. Heroes are born, fortunes are made, and legends are formed, when a person or a team leans in, risks it all, and wins big. One big hand can and will overwhelm dozens of small ones and often dictates who ultimately has the biggest stack of chips at the end. 3) Be willing to walk away from a hand if the situation changes… No matter how invested you are. We have all been in situations where something looked like a “sure thing” at the start, but then fell apart as more cards began to fall. Particularly at work, I have seen countless examples of projects that started with huge potential and investment, but through some unforseen technical challenge, a change in market dynamics, unexpected data, etc. that potential disintegrated over time. In these situations, it is excruciatingly hard to “walk away from the table”, because we are attached to the pot that we expected to win and the memory of the “good cards” that we had at the start. A sunk cost is a sunk cost, and you must be willing to cut your losses if the cards turn against you. Throwing more money against a pot just to justify the previous investment is a sure-fire way to go home with empty pockets. There is often a fear that walking away (or running!) is a sign of weakness or of invalidating the good work that happened early in the “hand”. It is entirely possible to make the right decision to bet big at the beginning and then to also make the right decision to “fold big” later on- we must be willing to adapt and to reassess as each card changes and accept that sometimes we must fold so that we can live to play another day. 4) Treat your chips as a finite resource and don’t play as if you can keep going to the bank for more. When I have gone to Vegas, I have always made a conscious effort to decide on an amount of money that I am willing to “invest” and then to lock my ATM cards in my hotel safe. If we play as if we have a blank check, we are more likely to bet big at the wrong times and to be less discriminating with our time and our money. Knowing that there is a finite number of chips to be played, we are more likely to invest our time, mind power, and money against the “high potential” hands, and to sit out the rest. 5) Know your competition as well as you know yourself. Poker is a game played against multiple opponents, and their choices will greatly impact your odds of winning no matter how good your cards might be. When the person across from you bets big, you need to know whether he only bets against a “sure thing”, bets recklessly, or bets unpredictably. 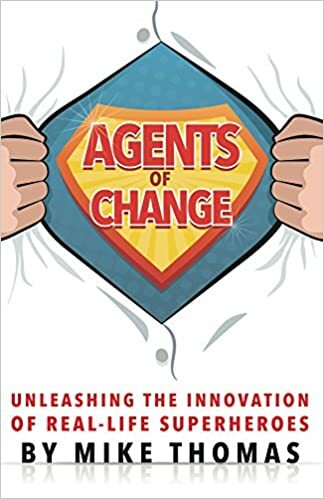 Often we make innovation choices based upon what our competition has done or upon what we believe that they will do next. If we don’t know our competition’s history, tendencies, and risk-profiles, we are leaving results up to chance. We need to know them inside and out so that when they act, we know whether to bet, to raise, or to fold. 6) No matter how well you play, and how good the odds are, be willing to accept that sometimes you will still lose. You might be dealt amazing cards, do everything right, and still manage to lose to some statistical improbability. In cards, in innovation, and in life, there are no guarantees of success, and you must be willing to accept that you might lose… and lose big. Over the course of a career, if you play the game the right way you should end up ahead, but you have to acknowledge and accept that some days you will go home empty-handed. I’ve been dealt a Four-of-a-Kind and lost to a Straight Flush… and while that is awful luck I can assure you that the next time I have Four-of-a-Kind I will bet big again. When you gamble, by definition, you will win some and you will lose some- you need to accept this fact and be ready to come back to the table and play another hand. The only way to never lose is to never play. 7) Putting logic aside… Sometimes, you still should play your hunches. Every so often, I will get dealt a hand that looks bleak statistically but that I have a “good feeling” about. In these cases, where instinct, experience, and energy pull you in a direction contrary to the logic and odds of a situation, you should not be afraid to stay in the hand long enough to see if the hunch pays off. This should not apply to every hunch, mind you, but to those rare ones in which you can’t necessarily explain why you should keep playing but know in your gut that you should. For me, the most successful project that I ever launched was the result of one of these hunches… I did not go “All in” from the beginning, but stayed in the game long enough for the right cards to fall and for the pot to get big enough that I ultimately invested big and won. Again, these should be the exception to the rule, but often our subconscious knows more then our conscious mind can comprehend and we should follow our instincts long enough to see how it plays out. At the end of the day, every choice that we make about how we spend our time, our effort, and our resources is a gamble. We only have so many chips that we can play, and how we choose to invest (and to not invest) those chips will dictate our ultimate success, happiness, and fulfillment. When we sit down at our various tables, we need to make sure that we don’t recklessly play too many hands, but also that we don’t unwittingly sit out the wrong ones. We need to be vigilant as the cards fall, agile as the circumstances change, and bold in our holding, raising, and folding, so that we can ultimately win the “Crazy Game of Poker”.